It is day six of chapter three in our family adventure. [Actually it’s now day ten – I’ve been distracted after a busy weekend!]. Chapter one was six months in an idyllic villa on two acres amongst the vineyards – blissful to say the least. Chapter two was an eight week road trip through France, Italy and Switzerland where we created a lifetime of memories. We stayed in everything from a camping ground to a rustic stone house to a chic, Scandinavian-designed loft apartment. 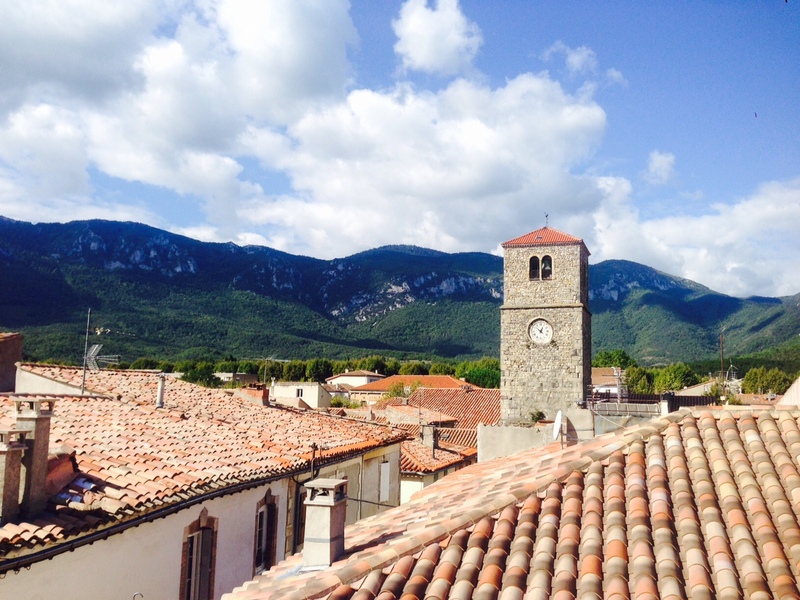 Fourteen kitchens later, I am setting up “home” in an apartment in Quillan, a village in South West France at the foothills of the Pyrenees. The apartment is directly above a bustling (during the warmer months anyway) cafe and overlooks what becomes the market square for the village every Wednesday and Saturday morning, set against a backdrop of glorious, looming mountains. In one way, I feel as if we are starting from the beginning again – figuring out where to shop and dine, establish which local doctor we should use, learn what days the bins go out, figure out how we can out smart any parking police by knowing the best spots each day and of course, get to know some locals! We have made some headway on the latter already. Our neighbour happens to be Australian and his wife is Vietnamese. They have already proudly shown us their garden allotment where they produce most of their own fruit and vegetables and they gifted us a beautiful Courgette Precoce Maraichere. 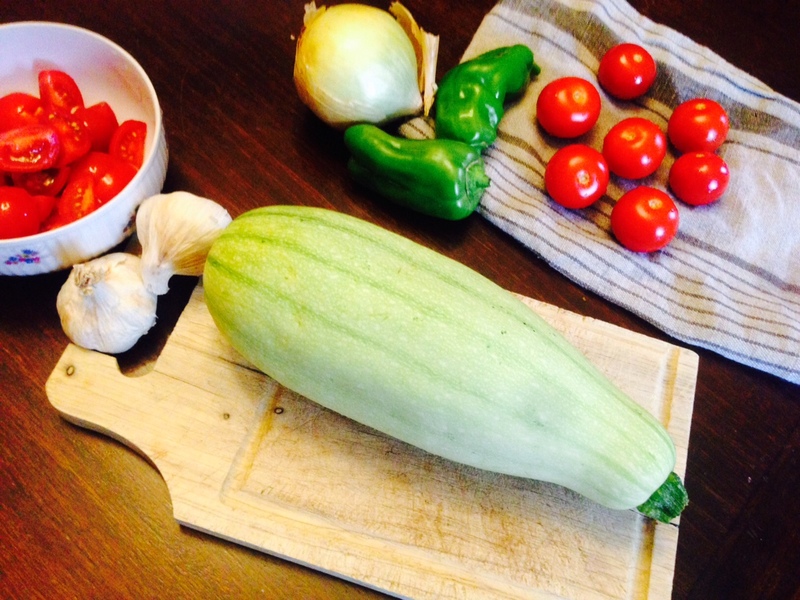 It’s a huge pale green variety of zucchini (often called a marrow) and I turned it into dinner (see recipe below). It’s human interactions like these that help me settle into our new way of life. It should feel “normal” by now, given we have been in France for almost nine months. I am amongst (mostly) french people. I understand them and mostly, they understand me. As the kids started their new school this week, it gave me an opportunity to pause and reflect on the lessons I’ve learned on this journey so far. There’s a story behind every one of them, but I’ve selfishly listed them quickly so I can remember these lessons and apply them elsewhere. Some of them are profound, some may sound petty, but each and every one of them has been a small win on a particular day when things may have been a little challenging and some are life lessons we need to be reminded of constantly. My family means more to me than I can ever put down in words. The gift of time and experiences with them in France is something I will remain humbly grateful for. I’ve learned to drive on the right (wrong?) side of the road. I’ve learned to be a more skillful and alert driver (I can hear my husband scoff) … mastering small spaces is survival in this country! I’ve learned the difference between jambon (ham) cru, cuit and sec … this may sound like one of those petty ones, but the day I figured this out was the day the clouds parted and the sun shone through! I’ve fallen in love with vegetables all over again … they taste so good here! 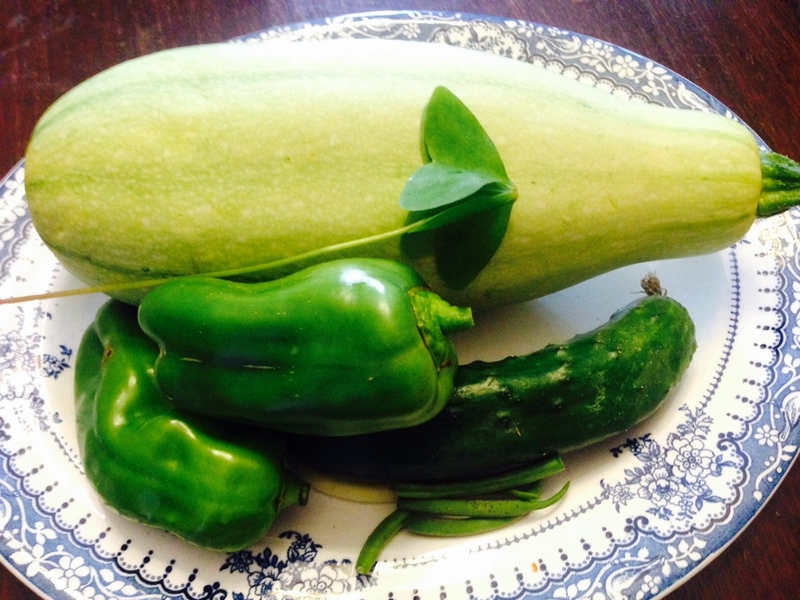 I’ve learned to truly appreciate nature and the seasonal produce she bares. I love seeing an abundance of fresh courgettes in summer and dreaming up new ways to eat them all (I’ve included one way in the recipe below). I indulge in blueberries in summer knowing they’re simply not available from October until May. It becomes a real treat. I’ve learned to be more patient. In France, you wait a lot. Often. In nearly all situations. Shop vendors are more interested in finishing their conversation with one customer than they are with serving the next. I respect this and am learning to wait patiently and to enjoy the process of a real conversation with each person I meet rather than it being simply a transaction. I’m learning that the digital economy here is not what we’re used to in Australia. Emails get answered when its convenient – face to face interaction takes precedence. Websites are rarely optimised or user friendly and it’s considered normal that the wifi rarely works perfectly. I’ve learned to have a great respect for the history and culture of this country and how it impacts people beliefs and attitudes towards food and their craft today. The word artisan is not just a marketing term – it holds great value and will often mean (if you ask and listen) that there is a beautifully rich family history associated with their work. I’ve learned to have more grace with people … one person’s opinion about something doesn’t mean they can be labelled or stereotyped. They are a whole person and it’s my responsibility to understand first rather than be understood. Having French as a second language is the best tool to force you to use your ears and mouth as God intended. I’ve learned to ask questions, ask for what I want, ask if I’m making sense, ask if I have understood correctly and ask about anything that is unclear. It’s the only way we can get by here but having the courage to ask has always meant we have made things happen and discovered new things. When we open doors, open our mind and open our heart, the experience is always richer. I’m learning the beautiful side to village life is that you can see and hear everything that’s happening outside your window. I’m learning that the drawback of village life is that you can see and hear everything that’s happening outside your window. I’m learning to live in old buildings and accept that a part of life here is that there is always something that doesn’t work all that well. Strangely enough, I get by with very few dramas. My expectations are changing for the better. I get resourceful and find other solutions. This list is by no means exhaustive and I’m sure as we become accustomed to village life, we will no doubt learn many more lessons. For now, I am enjoying this quaint, walk-everywhere lifestyle. 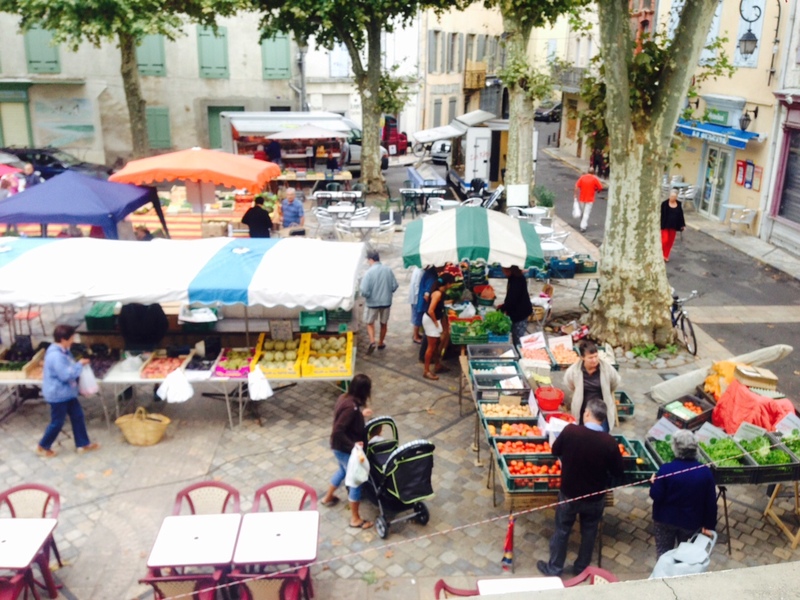 I can walk to the butcher, the baker, (no candlestick maker in town), market, cafe, restaurant, school, doctor, river, pool, gym, cinemas and even a local brocante store! I have spotted a piece of land available in a community garden and perhaps, with a few lessons from my earnest and eager neighbour, I may even get my hippy on and grow a few vegies. There’s nothing that inspires me to cook more than super fresh locally grown produce without chemicals and with loads of love. I took the enormous courgette and decided to do a courgette farci. It sounds so much nicer in French … Stuffed Zuc is the Aussie translation. This is a perfect midweek meal and one you can change up depending on what’s in season and what’s in your kitchen. Don’t overcomplicate it with too many flavours, just season well and enjoy the flavour of the vegetable. Prepare the rice in a rice cooker, on the stove or in your Thermomix. This can be done in advance and set aside. Heat the oven to 180 degrees. In a large pan, heat 1 tbsp olive oil to medium high and saute the onion and garlic until soft and translucent. Add the bacon and cook until browned, about 5 minutes. Add the tomatoes and season to taste with salt and pepper. Cook for a further 3 minutes until the tomatoes just start to soften. Turn off the heat and set aside. I used left-over stuffing in a tomato and capsicum and served it all up! 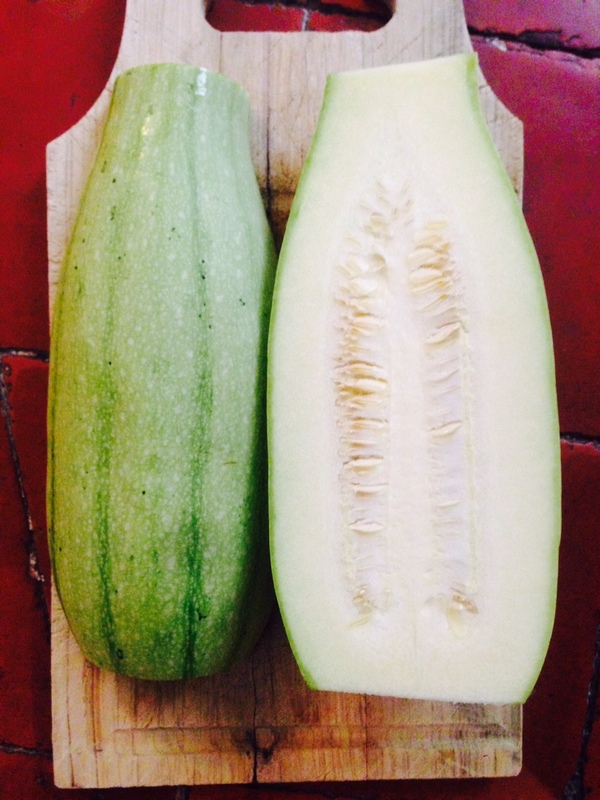 Wash the marrow or zucchini, trim the ends, slice in half horizontally and scoop out the seeds. Reserve for use in a stir-fry or vegetable stock. Combine the rice with the bacon and tomato mix, adding an extra tablespoon of olive oil if needed. Stir in the chopped parsley (reserving a little for the garnish) and ensure it is well combined. Spoon the rice mixture into the hollowed out zucchinis and push down to form a mound on the zucchini. 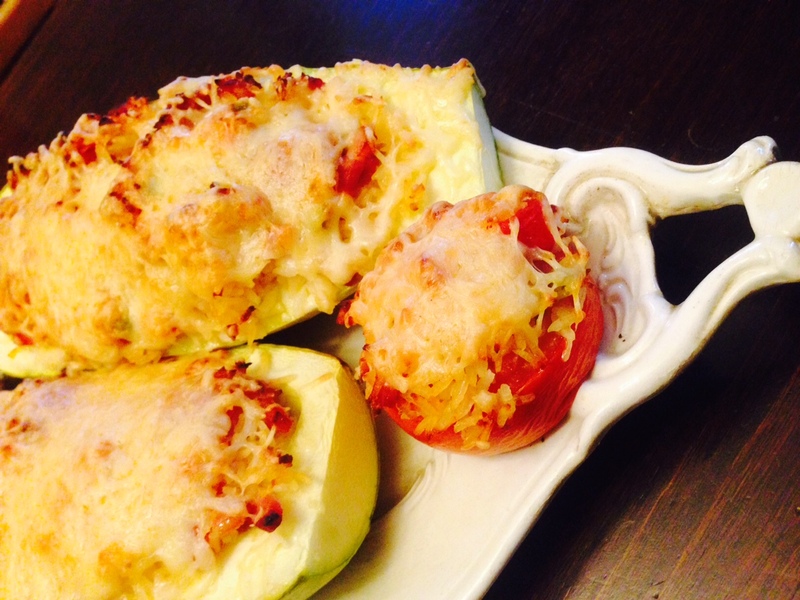 Sprinkle with grated cheese, season again and put into the oven for approximately 30 minutes until the marrow is cooked through and the topping is golden. Serve with a sprinkling of fresh parsley, a side salad and crusty baguette. This could easily be a vegetarian meal – substitute the bacon for olives and add a dash of lemon juice and lemon zest to the rice mixture. You can also substitute the rice for chick peas, cous cous or breadcrumbs – the options are endless. I’m off to slow cook some lamb for dinner … despite the intense blue sky and glorious September sunshine, the mornings and evenings have quickly become cool enough to hint at Autumn … cool enough for some good ol’ roast dinners. Great read Kate! I loved your lessons learnt! It sounds like Cambodia sometimes – the waiting in shops, WiFi, things never quite working! Keep writing! I love it!